You'll be £19.99 closer to your next £10.00 credit when you purchase Givenchy in the Great War. What's this? Order within the next 5 hours, 4 minutes to get your order processed the next working day! The village of Givenchy-lès-la-Bassée sits on a small rise in the Pas de Calais Department in northern France. One hundred years ago it was overtaken by the First World War. The fighting there was intense – eleven Victoria Crosses were won in this tiny locality between 1914 and 1918. 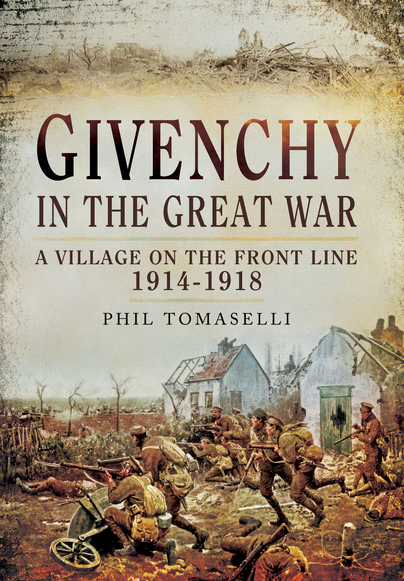 Phil Tomaselli’s in-depth account shows what happened at Givenchy when it became a battlefield, and the story here was repeated in the other villages and towns on the Western Front. Givenchy’s key position made it the target for crushing bombardments, infantry assaults and subterranean warfare. The landscape was pulverized by shellfire, the ground beneath was honeycombed with tunnels. Mining operations, shelling, sniping and trench raids took place around the remains of the village even when this stretch of the front line was relatively quiet. The gruelling struggle of attrition that characterized the fighting on the Western Front continued here throughout the war. Phil Tomaselli’s gripping narrative makes extensive use of war diary extracts, personal stories, official and unofficial histories. This is an excellent read and certainly a book for the serious military historian. In format this is a good example of the standard modern First World War battle history, with a good mix of narrative and eyewitness accounts (not too heavy on the eyewitness statements, which can sometimes bog down some texts). It would have been nice to have had more information on what happened to the villagers, but otherwise this is an interesting work. With extensive use of war diaries, personal accounts and official and unofficial histories the author tells the village's story. At 240 pages, the book is complimented by an extensive index and bibliography as well as contextualised and contemporary photographs throughout thus giving the reader a comprehensive feel of the battles one hundred years ago, but also how their location looks today. Amongst many poignant photographs is one of the unveiling of the 55th Division's monument by Marshall Joffre and General Jeudwine; Given that much of the action took place in the early years of the war, the book incorporates beautiful paintings as opposed to photographs There are useful maps which help the reader to understand some of the battles. Another crucial, fascinating book. I want to re-read this one some time soon. Phil Tomaselli has written extensively on military and family history and he has made a special study of the Western Front, in particular the decisive campaign of 1918. He has published many articles on aspects of army and air force history.